"When a galactic force threatens the world…! Test your gear, find your courage…" Focus has debuted a trailer for the CG animated Ratchet and Clank movie, adapted from the very popular and very amusing video game series of the same name. It's not exactly the most innovative video game adaptation, but I have to say, this looks crazy fun. James Arnold Taylor voices Ratchet, David Kaye voices Clank, and Jim Ward voices Captain Qwark, along with Bella Thorne, Sylvester Stallone, Rosario Dawson, John Goodman and Paul Giamatti all lending their voices to this, too. This is co-directed by the guy who made the TMNT animated movie as well. Even if you're not a fan of the video game series, give this a quick watch. A CG-animated movie based on the iconic PlayStation video game. Two unlikely heroes struggle to stop a vile alien named Chairman Drek from destroying every planet in the Solana Galaxy. Ratchet is the last of his kind, a foolhardy "lombax" who has grown up alone on a backwater planet with no family of his own. Clank is a pint-sized robot with more brains than brawn. When the two stumble upon a dangerous weapon capable of destroying entire planets, they must join forces with a team of colorful heroes called The Galactic Rangers in order to save the galaxy. Along the way, they will learn about heroism, friendship, and the importance of discovering one's own identity. 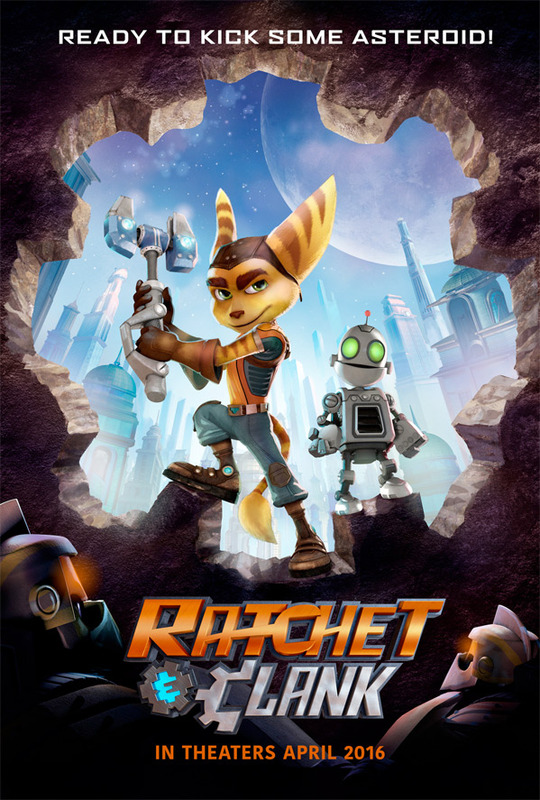 Ratchet and Clank is co-directed by animator Jericca Cleland and Kevin Munroe (of the TMNT animated movie, and Dylan Dog: Dead of Night). Focus Features will release Ratchet and Clank in theaters April 29th, 2016 next year. Thoughts? Big fan of the game, looks like fun!!! Love these games. Looking forward to the movie. But the trailer was weak. Ratchet is the cutest. I gotta play these games again. This franchise was my favorite as a teenager. So fun, so tongue-in-cheek. I really hope it is as good as the cut scenes from the games. These games were surprisingly fun and addicting. This should be good. "Like a 7..." Like it!